Charleston Air Force Base lost one of its best friends last month when retired Lieutenant Colonel Colonel Jay Marts of Summerville died. Marts had an extraordinary career, first in the Air Force and later with the Ford Motor Company in Detroit. He flew fighters for 21 years, ranging from early World War II P-39s to Korean War era F-86s. His first love, however, was the P-51 Mustang. When his combat tour was over in 1945, he was transferred to California where he accepted several of the then-new P-80 jet fighters for delivery to the Air Force. Major Phil Guin, the senior Protestant chaplain at the base, conducted a memorial service for Marts. He said Marts and his wife worshipped at the base chapel every Sunday. According to Sowers, Marts held the Silver Star, the Distinguished Flying Cross, the Air Medal with 11 oak leaf clusters, the Presidential Unit Citation and five battle stars. He said Marts, 79, was serious when he recently told him he was ready to fight in the war against terrorism. “He even had his old flight suit and mess dress uniform, hanging in his closet,” Sowers said. 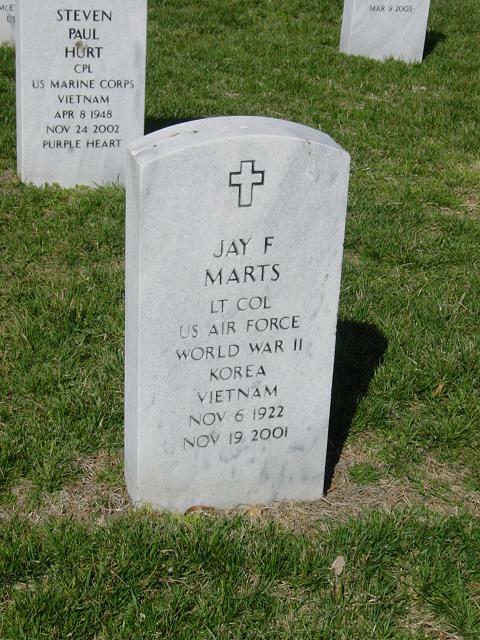 Marts will be interred at Arlington National Cemetery.